kim Kardashian has never for once showed she's a forgetful mother but in Paris yesterday, Oct. 2 the reality TV star completely forgot her daughter - North West - wasn't in her arms as she exited her hotel. The star stormed out of Hotel Le Royal Monceau in Paris without her most valuable fashion accessory - her daughter. The video, posted by French celebrity site Storm Shadow , appears to show Kardashian in her pink Chanel finest ready to climb into an SUV before turning tail and retreating back into the Le Royal Monceau. The star looked confused and scared behind her dark shades as was seen asking her security where her daughter was. Few minutes later, she's seen emerging with her 1-year-old daughter with hubby Kanye West tucked under her left arm. The little girl appeared frightened and held tight to her mom and photographers screamed and flashed camera lights on both of them. 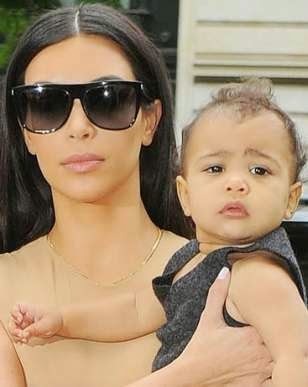 Kim later got into her car with her daughter and drove off to the Charle de Gualle airport to fly back to Los Angeles. She and her family were in France for the Paris Fashion Week. Do you think Kim Kardashian actually forgot her precious daughter in the hotel?